“It’s a bird, it’s a plane…..it’s a cat?” Have you ever wondered what type of pets the most famous super heroes on our planet would have? 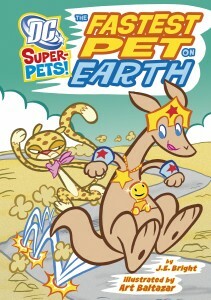 You can find out in the fabulous DC Super-Pets new children’s chapter book series. My five year old son is learning to read and his eyes almost bulged out of his head when he saw this new book series. He immediately wanted to “practice” his reading skills so we sat down to read the adventure title, “Streaky the Super-Cat” who proceeds to battle his arch nemesis, “Rozz the Evil Siamese” who has kidnapped a royal hamster. Will Streaky the Super-Cat be able to save him……….? Written by John Sazaklis and illustrated by Art Baltazar this book is thoroughly fun and entertaining. It is also written in a style that is very attractive to young children. My son was thrilled with the words that he was able to read himself and I was happy to fill in the blanks for him. My husband tells me that Super-Pets have occasionally appeared in DC Comics before but this particular series gives them lead character role. Released by Capstone Publishers, this series is geared for early readers in grades 1-3. There are currently six titles available with 24 total books scheduled in this series. Overall this is a very fun adventure series that has really encouraged all of my children to practice their reading and pre-reading skills. 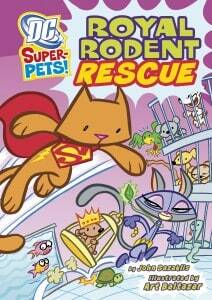 You are invited to watch a fun book trailer for DC Super-Pets on You Tube.